BBC Radio 4 - Costing the Earth, Wave Goodbye? Tom Heap asks if the decades of research into harnessing waves and tides to solve the energy crisis have brought the utopia of a wave-powered Britain any closer. 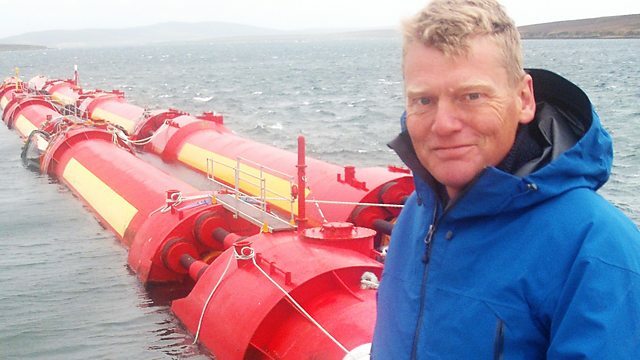 In the choppy waters around Orkney the hopes and dreams of hundreds of scientists, engineers and investors are being pushed to the limit. At the test sites of the European Marine Energy Centre eleven different ways of harnessing the power of the sea are being tested. After four decades of promise Britain seems to be on the verge of discovering how to turn the tides and the waves into useable electricity. All that's holding the industry back is money. Money, and the fearsome engineering difficulties of building and maintaining power stations in the harshest conditions imaginable. For 'Costing the Earth' Tom Heap travels to Orkney to meet the international cast of maritime engineers welding, soldering and modelling their way toward a low carbon Nirvana.